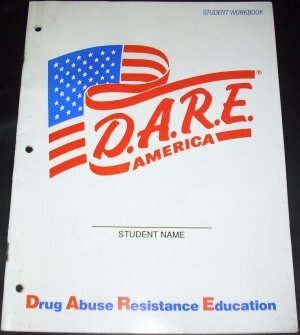 Here's to remembering the high point of elementary school in honor of National D.A.R.E. Day! Finally being a part of the D.A.R.E program was the highlight of your fifth grade career. You had the privilege of being "friends" with an actual cop. You finally got to rock the shirt you saw all the older kids wear. If you were lucky you got extra swag, like this badass backpack. The best part of your week was D.A.R.E. You never slacked. All because you didn't want to disappoint this guy. Whose tax money paid for this?! You might have collected these sick D.A.R.E. officer trading cards. In fact, you were even willing to narc on your family. Submit anonymous tips about your loved ones here. And when it came time to pledge, you were the first to raise your hand. You accepted that certificate with pride. And you couldn't wait to take your class photo. (That's you in the glasses). Or finally graduate after all your hard work. So congrats on never doing drugs or drinking underage!